In Issue 32, the aftermath of the battle near Snake-Eyes’ cabin was brought to a conclusion. One of the earliest Crimson Guardsmen, Fred did not make it. He was replaced with a look-alike who showed up on the doorstep of the Broca residence just outside the gates of Fort Wadsworth. On the Joe side, new Joes began showing up indicating they were replacements. Feel free to check out the review of Issue 32 in case you missed it. The issue begins with preparations for a grand re-opening for the newly renovated PIT: the G.I.Joe Headquarters. Of course, too much fanfare around a top secret base of a top secret special forces unit on the same location where a battle took place back in Issue 19 could lead to troubles. 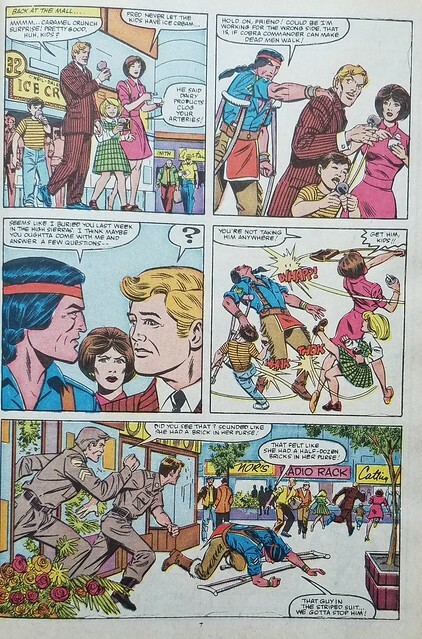 Scarlett visits Snake-Eyes, Airborne and Spirit who are recuperating from their injuries in Issues 31 and 32. 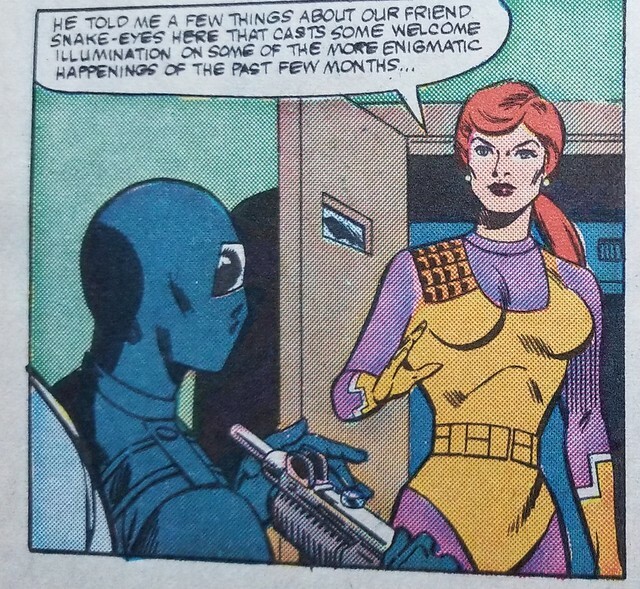 She has been talking with the Soft Master who provided some information about Snake-Eyes and his past. Airborne tries to get Spirit to wake up so they can leave for a few minutes and give Scarlett and Snake-Eyes some privacy. 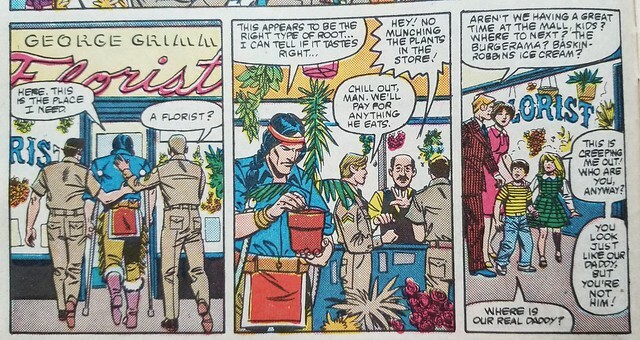 Spirit is helped by a few Joes and they are visiting a local florist to see if Spirit can find the roots and natural herbs he is looking for. He prefers holistic medical approaches to help supplement his healing. But of all the luck, look who else is at the mall. The Broca family, part 2. Well, the second Fred, and the first Fred’s family. The kids are creeped out by their replacement Dad, and he thinks buying them ice cream will win them over. Elsewhere, in Springfield, Major Bludd, the Baroness and Billy are practicing for an assasination. Bludd tells Billy he needs to recite a poem and then pull out the gun for the kill. He mentions the poem is by a “Major” poet. What a sense of humor, Sebastian. Destro catches up with the Baroness and confronts her about her plans and the company she has been keeping. They have a short discussion about trust. 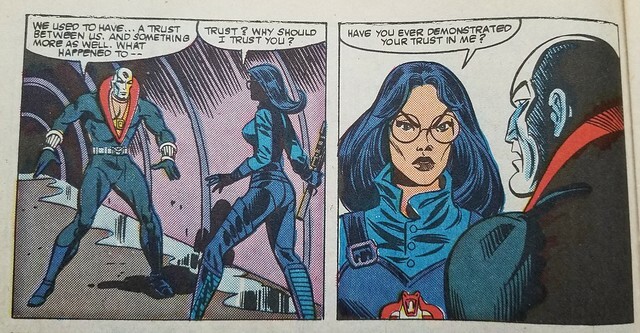 Destro removes his mask, and reveals his identity to the Baroness. Back at the mall Spirit confronts the Broca family and is treated rather poorly. 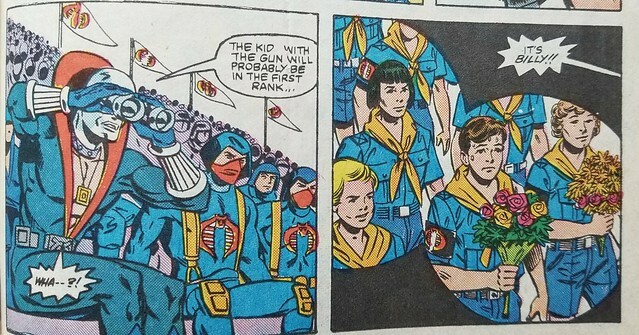 Cobra teaches even the children to be insolent. Tsk, tsk, such poor manners. 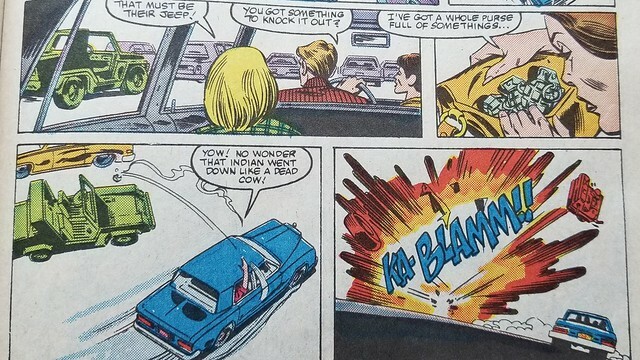 After assaulting Spirit, the Brocas run away and get to their car in the parking lot. It is there we see how truly dangerous Mrs. Broca is. She vaporizes a V.A.M.P. with a grenade from her purse. You’d think they would be sturdier than that. You’d also think there would be collateral damage to vehicles adjacent to the V.A.M.P. But no. 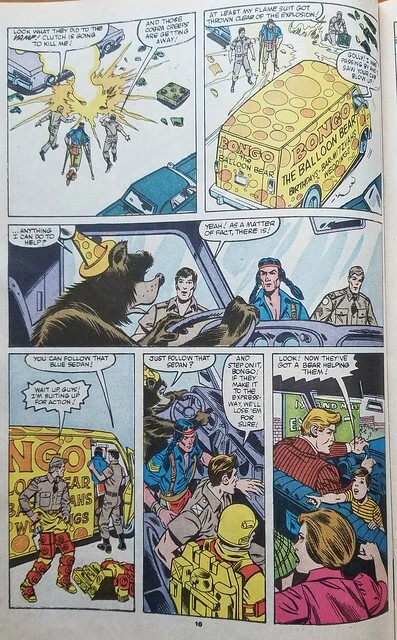 A custom van advertising a balloon business on the side pulls up, as the Joes Blowtorch, Ripcord and Spirit arrive to their ruined V.A.M.P. Blowtorch finds his gear that somehow was thrown clear in the explosion. Back at the stadium in Springfield, Storm Shadow reviews security precautions and counter-measures with Cobra Commander. Storm Shadow makes sure he is protecting the Commander in order to find out the identity of his uncle’s killer. 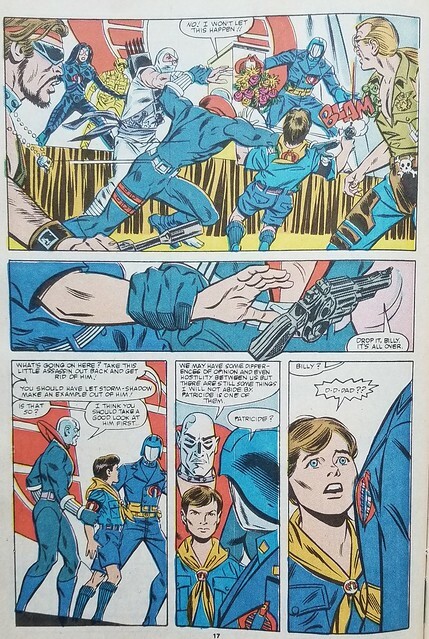 Destro expresses his concerns to the Baroness, now revived, about using a child as an assassin. But she contends that Bludd is committed to the plan. Back in the car chase, Cobra is not at all keeping a low profile. They have a rear facing missile launcher hidden in the trunk. It looks like the Joes and Bongo the Balloon Bear are goners!! Somehow, Blowtorch figures out the missiles are heat-seekers, and he commits flagrant arson to save their lives. He hits a clothes donation drop off bin with a blowtorch, and the resulting fireball gets the missiles to go off course. 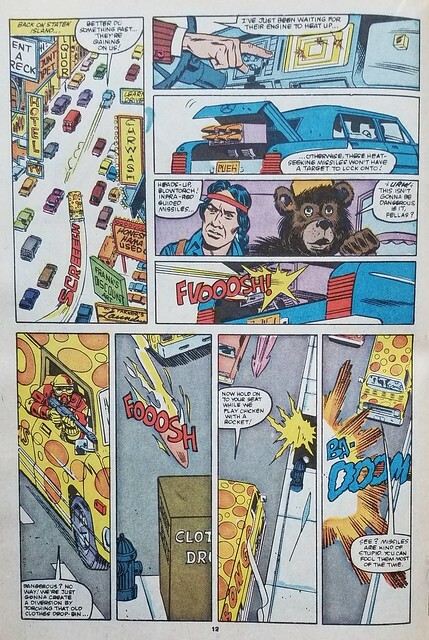 Bongo might be the wisest person there, evidenced by hopping out and letting the Joes continue the chase without riding along. Cobra Commander is giving a fine speech at the Springfield stadium rally. 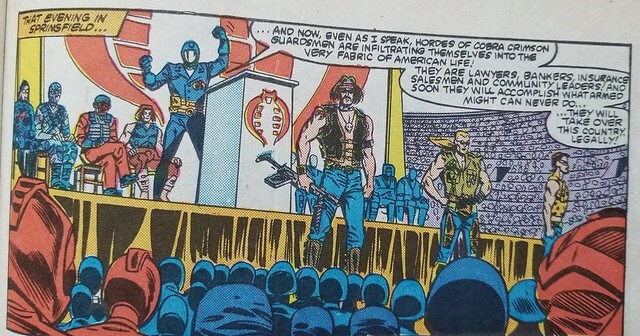 Someone might explain to me someday why the Dreadnoks are standing guard at a rally in a stadium full of uniformed terrorists. Someone also might explain why Wild Weasel and Firefly are on stage behind the Commander, while Destro is in the nosebleed bleacher seats. Maybe he auctioned off his backstage pass when he found out about the assassination plot? Destro notices Billy and starts making a move to prevent the attempt. 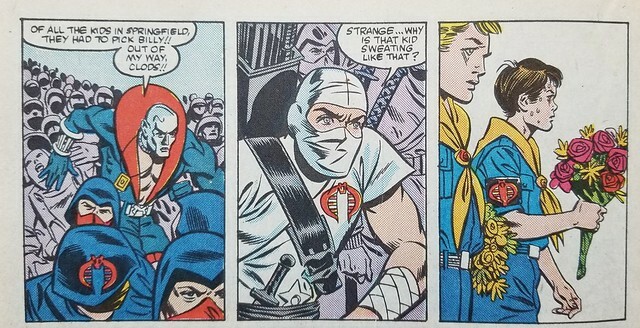 Storm Shadow shows finesse in profiling behavior rather than gender, age, or ethnicity. He looked for someone with a nervous demeanor, in this case somebody who was sweating profusely. Hmm, profiling behavior, what a great idea!! Storm Shadow is about to slice young Billy in two. One Cobra blurts out “He’s got a gun!” Okay, there is a stadium full of highly trained terrorists in battle uniforms. And one guy has to yell out as if he’s an audience member on a talk show. Grow a spine, man! The attempt is foiled by Destro, but a much larger secret is revealed. Billy is the Commander’s son. 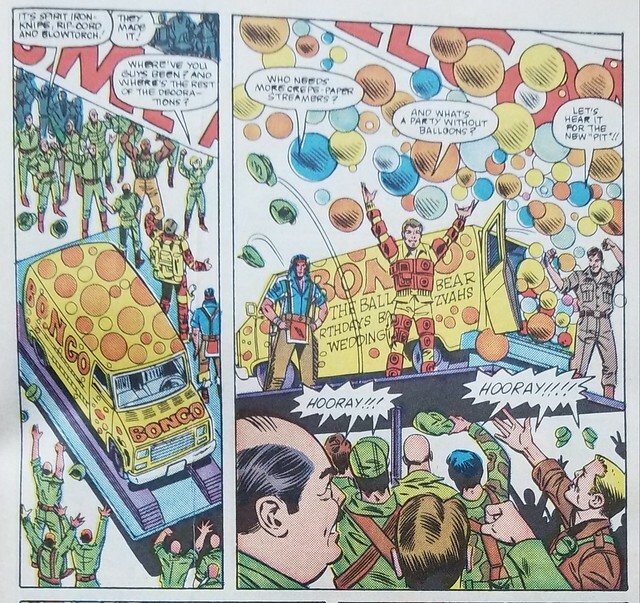 The Joes lose the Broca family, so they return to the Pit with the Balloon van and release balloons for the party. General Austin announces the original Joes are being “promoted” to desk duty, and the new Joes will be sent out on field assignments. 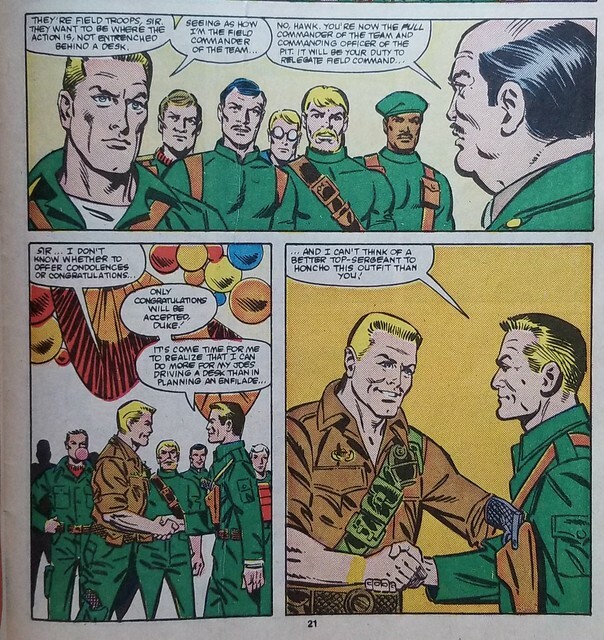 Hawk stands up for the Joes in one panel, then acquiesces or agrees in the next, turning over field command to Duke. 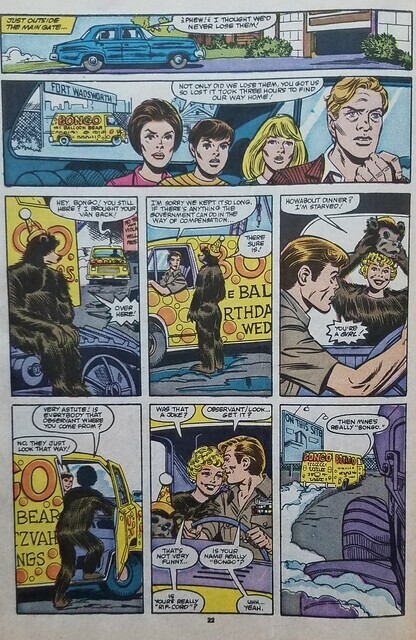 The issue wraps up with Ripcord returning the van to Bongo, who takes off the Bear head costume to reveal she’s a girl. Ripcord appears to have made a new friend. 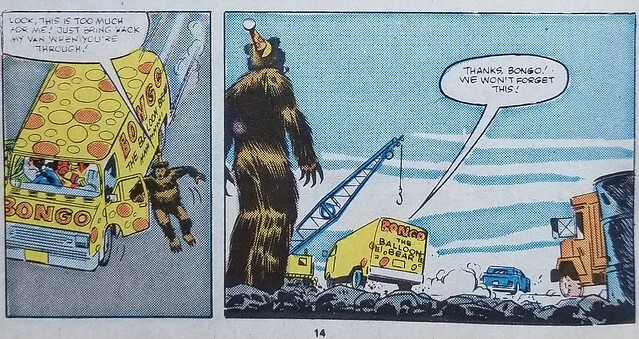 This issue had a mix of humor and action. The party at the Pit seems like an odd idea, but it fit in with that part of the story. 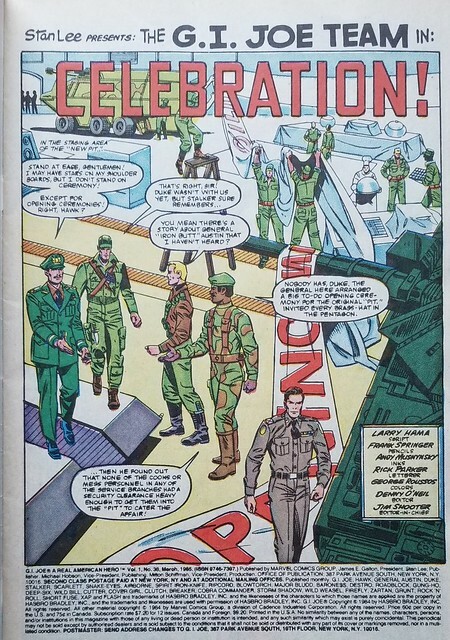 I always wondered if Hasbro wanted Larry Hama to discontinue characters to promote new action figures, and having them shifted to training and desk duty was the beginning of these plans. Then write some stories with new Joes, then retire them when the next wave of figures needed a story. If someone knows, feels free to comment. Tune in soon for Issue 34: A battle in the skies will test the Joe pilot Ace to his limits. Now You Know – a little more about: ”CELEBRATION!” Feel free to let me know what you thought of this issue in the comments AFTER THE JUMP. Tagged Cobra Commander, Destro, G.I.Joe, G.I.Joe Comics, Hasbro, Larry Hama, Marvel Comics, Snake Eyes. Bookmark the permalink.